Are You a Self-Sabotaging Academic? It’s difficult enough being an academic, without setting yourself up to fail. Yet countless harried and hassled graduate students and professors do this daily. How do they do it? Let me count the ways. They put too many things on their schedule. Then they get upset when they don’t do them all. They set unrealistic deadlines for themselves. Then they get upset when they don’t meet them. 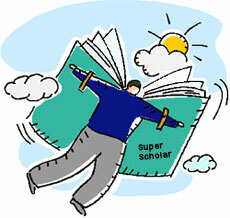 They think that other scholars write quickly and easily. Then they get upset with themselves when they find writing slow and difficult. The result of putting yourself into these kinds of situations is that you end up feeling inadequate and ineffective, and you don’t trust your own scheduling, planning and writing skills. This lowers your self esteem and decreases your motivation. This self-sabotaging pattern comes about as a result of a conflict between expectations and reality. If you expect yourself to perform at an unrealistic level, you’re bound to be disappointed in yourself. How can you change this pattern? To find some answers, let’s examine this in terms of setting deadlines, a skill that tends to trip people up a lot. This is the side of you that is reasonable and objective. “Adult You” knows that you need to set a deadline, lets say for finishing your current chapter, in order to motivate yourself and keep yourself on course. You know you should set a reasonable deadline, which will allow for all the other things happening in your life. You also know that there is an optimum amount of time you should spend writing on a daily basis, say 30 minutes. This side of you sees everything in extremes. If you don’t finish that chapter in 3 weeks! Everything! Will! Go wrong! What happens when these four sides of yourself get together? Well, 3 out of 4 of You agree – that chapter can be finished in 3 weeks! This final voice of reason is there, somewhere deep inside your head. But unfortunately, you can’t hear it. It’s drowned out by the other voices. Maintain a list of positive affirmations about your abilities, intelligence, and situation. Read it frequently. This will help you strengthen “Adult You.” And if you sign up for this newsletter (see upper left hand corner of this page), you will receive 4 pages of Positive Affirmations for Academics,” in addition to two other fantastic bonuses. I believe that nobody sets out to sabotage themselves. If you follow these steps, you will feel more in control of your academic future, and feel better about yourself. And that strange buzzing in your head will stop.